« SND – Couscous Salad! Baking has definitely always been my MawMaw’s domain. Every holiday each member of the family got their own favourite dessert, and not just a slice: whole cake or pie. It was very impressive. And intimidating. How will I ever match that!?!? Until this cake, I’d always settled for a fairly easy cakes that could be done in one layer. Or cookies. I’m good with cookies. But, for my birthday last month, I decided to bake my own cake. I was never going to learn if I didn’t try, you know? I was just slightly ambitious, because I set out to make two cakes: one chocolate and one vanilla. Yea, that didn’t work out as well as I’d hoped. 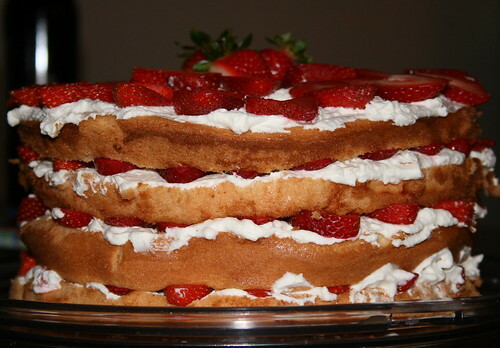 But despite my lack of experience in baking, I thought the strawberry shortcake turned out rather well. I found the recipe on my favourite foodie blog: Smitten Kitchen. Hers turned out, of course, much, much prettier than mine. But I was happy to have successfully baked a cake…and with only a few problems with deflating egg whites. Recipe below taken almost exactly from Smitten Kitchen. My skills in baking thus far extend only to following instructions – I’ve not yet moved to “improving” them. My only concern was the cooking time – the cake seemed done after 30 minutes both times I’ve cooked it. I left it in an extra 5 minutes the second time, just to make sure it was finished… and my MawMaw immediately said, “Tastes good, but you cooked it five minutes too long.” Well, okay then. Next time, I’ll pull it out at exactly 30 minutes. After two rounds, I’m still working on the whipped cream/cake/strawberry ratio. 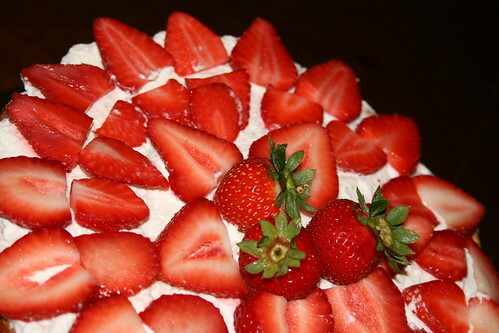 It needs lots of strawberries to even out the cake and cream… but too many, and it starts to topple. But at least make sure you can see the strawberriers. 2 quarts strawberries, hulled and sliced (slice pretty thick; 3-4 slices per strawberry. 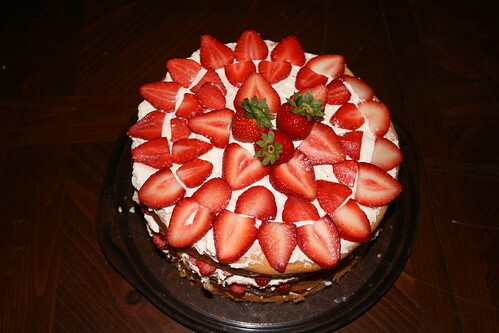 For the second cake, I used an entire flat of strawberries and it turned out pretty well). 1. Make cake layers: Preheat the oven to 325 degrees. Have two 9-inch round cake pans ready, lined with parchment paper that has been lightly sprayed with cooking spray, but otherwise ungreased. (Second time, I didn’t have parchement paper, so I just buttered and floured – it turned out okay). 2. Sift the flour, 1¼ cups sugar, baking powder and salt together twice into a large bowl. (This really does help make the cake fluffier – I need to get a real sifter). 3. In a another bowl, beat the yolks, water, oil, zest and vanilla on high speed until smooth. Stir into the flour mixture until smooth. In another large bowl, or the bowl of your stand mixer, beat the egg whites with the cream of tartar until soft peaks are formed. Add the remaining ¼ cup sugar, and beat on high speed until the peaks are stiff but not dry. (This is the part I’m still working on; egg whites baffle me – and I don’t think I’ve ever reached “stiff peaks”). 4. Use a rubber spatula to fold one-quarter of the egg whites into the egg yolk mixture, then fold in the remaining whites. Do so gently, only until the egg whites are no longer visible. Overdoing it will deflate the egg whites, and yield a denser, shorter cake. (The first time, I definitely deflated some of my eg whites; the second time, I folded in a few more times and didn’t reach “stiff peaks” and yet still had a fluffier cake with a better consistency. I’m not sure what to say about that). 5. Scrape the batter into the two prepared pans and spread evenly. Bake them until the top springs back when lightly pressed and a toothpick inserted into the center comes out clean: start checking at 30 minutes. 6. Let cakes cool on a cooling rack for at least an hour When completely cool, run a knife around the sides to release, then flip out onto a plate (or your hand, if you’re daring) and then another plate. 7. Make the whipped cream: Beat heavy cream, powdered sugar and vanilla extract in a clean mixing bowl until it holds stiff peaks. 8. Assemble the cake: Carefully split each cake layer in half, leaving you with four cake surfaces. One by one, scoop one-quarter of the whipped cream onto the surface of the cake and spread it evenly to the edges, without going over, with an offset spatula. Arrange one-quarter of the sliced strawberries over the whipped cream in one or two layers, depending on your preference. (If you use only one layer, you’ll likely have leftovers.) Repeat with the remaining three layers. 9. The cake can refrigerated for a few hours before eating it.